Shaping the future of energy over the long term means reducing CO2 emissions whilst at the same time guaranteeing security of supply. The principle focus is on an ever-growing number of decentralised energy producers, integrating prosumers (consumers that produce) and making use of new storage technologies. Especially in integrating technical solutions and working business models there is much potential. The research company Aspern Smart City Research GmbH & Co KG (ASCR) has been tackling these challenges by focusing on solutions for the future of energy in urbanised areas since 2013. 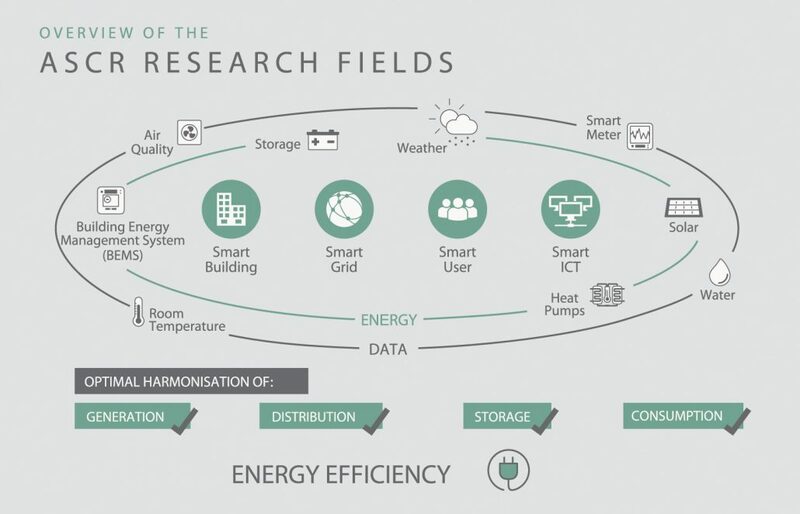 Research is being carried out under real-life conditions with the use of data gathered in the new aspern Seestadt district in Vienna, involving all the components of the energy system – the grid (Smart Grid), the buildings (Smart Building), information and communication technology (Smart ICT) and the users (Smart Users). The results are used in order to develop smart and efficient solutions for future urban development, energy planning and living comfort. ASCR provides research which is the basis for developing and running future energy systems in urban areas. The guiding principle of ASCR is “the whole is more than the sum of its parts” – as the research company examines how all these components and systems interact. The focus here is on forward-looking building automation and using a building’s energy flexibility. Users are proactively involved in the development work with the aim of designing customised products and services that improve their quality of life. Furthermore, optimum methods are determined to record the grid status in order to improve network planning. All these solutions are based on comprehensive information and communication technology for which suitable models are being tested and developed in order to process large amounts of data. The research findings are intended to make a key contribution to developing scalable solutions for the future energy needs of whole cities. However, the research company Aspern Smart City Research GmbH & Co KG (ASCR) has been tackling these challenges by focusing on solutions for the future of energy in urbanised areas since 2013. Real data from the new aspern Seestadt district in Vienna are being used for research purposes involving all the components of the energy system – the grid (Smart Grid), the buildings (Smart Building), information and communication technology (Smart ICT) and the users (Smart Users). ASCR is a test bed for the future of energy provision in urban areas, where research results will help to shape the development of solutions to the challenges posed by grid operations. At Seestadt, research is being carried out in real life situations, with real users providing actual data, data that will be used to shape the future of grid planning and energy efficiency in urban areas. The guiding principle of ASCR is “the whole is more than the sum of its parts” – as the research company examines how all these components interact. The focus here is on forward-looking building automation and using a building’s energy flexibility. Users are proactively involved in the development work with the aim of designing customised products and services that improve their quality of life. Furthermore, optimum methods are determined to record the grid status in order to improve network planning. All these solutions are based on comprehensive information and communication technology for which suitable models are being tested and developed in order to process large amounts of data. The research findings are intended to make a key contribution to developing scalable solutions for the future energy needs of whole cities.